Clean CARFAX - No accidents - Fully Serviced - QUALITY CERTIFIED up to 10 YEARS 100,000 MILE WARRANTY PREMIUM PACKAGE Heated Rear Seat(s) Seat Memory Rear Parking Aid Back-Up Camera Power Passenger Seat Adjustable Steering Wheel Power Driver Seat Heated Front Seat(s) HID headlights Passenger Adjustable Lumbar Driver Adjustable Lumbar Power Steering FRONT & REAR PARKASSIST W/REVERSING CAMERA Rear Parking Aid Back-Up Camera BI-XENON-HEADLIGHTS W/PDLS HID headlights *Note - For third party subscriptions or services, please contact the dealer for more information. * Put performance, safety, beauty, sophistication and all the right amenities into a car, and here it is! Now you can own luxury without the luxury price tag! This Porsche Panamera 4 comes equipped with all wheel drive, which means no limitations as to how or where you can drive. Different terrains and varying weather conditions will have little effect as to how this vehicle performs. The Panamera 4 is well maintained and has just 36,905mi. This low amount of miles makes this vehicle incomparable to the competition. Marked by excellent quality and features with unmistakable refined leather interior that added value and class to the Porsche Panamera Take the guesswork out of where you are going with the top-tier navigation system found on this exceptional Porsche Panamera. Rest assured, this vehicle was well care for. In fact, previous service records are included. Pre-owned doesn't have to mean used. The clean interior of this Porsche Panamera makes it one of the nicest you'll find. Speed is a game changer and this awesome machine is so fast it didn't just change the game, it rewrote all of the rules. This 2014 Porsche Panamera 4 is not like every other automobile. The Porsche was equipped with many of the added features that make this vehicle such a unique automobile to own and drive. The paint and body on this Porsche Panamera 4 looks as fresh as the day it rolled off the assembly line. A perfect find to complement any rare automotive collection. This beautiful lass will turn heads everywhere she goes. More information about the 2014 Porsche Panamera: The Panamera's front engine design may depart with traditional Porsche design, but its elongated shape provides comfortable seating for everyone--even for passengers over 6 feet tall. It features up to 45 cubic feet of cargo space with the rear seats folded. And, it wouldn't be a Porsche if it didn't out-handle and out-accelerate almost everything else on the road. Two hybrid models bring performance and green credibility, while the Turbo S could be the most powerful station wagon available. The base trim starts at around $78,000, but there is no other car available that looks, handles, or hauls like a Panamera. Interesting features of this model are Unmistakable styling, Porsche-standard performance and luxury, seating for four in well-appointed interior and hybrid powertrain available No Credit / Bad Credit / No Paystubs, No problem !! ! All Approved ! Everyone drives ! CLEAN, GORGEOUS, LOW MILES, SHOWROOM CONDITION. CALL NOW QUALITY CERTIFIED up to 10 YEARS 100,000 MILE WARRANTY , To Certify a vehicle, there will be an additional cost for Certification. CALL NOW For details. STUNNING AGGRESSIVE LOOK ON THIS BEAUTIFUL--Call today to schedule a test drive... Good Credit/Bad Credit/No problem!!!! Get paid cash? No problem!! 100% Credit Approval with interest rates starting at 2.49% for qualified customers, our rates will not be beaten. We price our cars at wholesale price to guarantee the best deals for our customers. Our inventory moves quick, please call to confirm the availability of the vehicle of your interest Springfield location 973-564-0112. This vehicle is located at our SPRINGFIELD location. Come visit our new showroom in Springfield NJ. 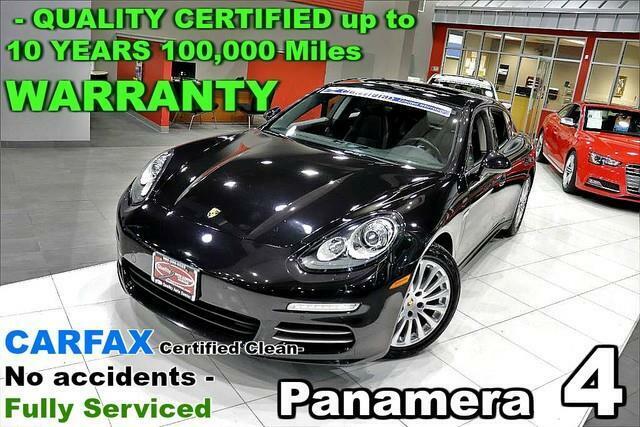 Quality Auto Center is honored to present a wonderful example of pure vehicle design... this 2014 Porsche Panamera only has 36,905mi on it and could potentially be the vehicle of your dreams! There's a level of quality and refinement in this Porsche Panamera that you won't find in your average vehicle. It's not a misprint. And the odometer isn't broken. This is a very low mileage Porsche Panamera. A rare find these days. You've found the one you've been looking for. Your dream car. More information about the 2014 Porsche Panamera: The Panamera's front engine design may depart with traditional Porsche design, but its elongated shape provides comfortable seating for everyone--even for passengers over 6 feet tall. It features up to 45 cubic feet of cargo space with the rear seats folded. And, it wouldn't be a Porsche if it didn't out-handle and out-accelerate almost everything else on the road. Two hybrid models bring performance and green credibility, while the Turbo S could be the most powerful station wagon available. The base trim starts at around $78,000, but there is no other car available that looks, handles, or hauls like a Panamera. Strengths of this model include Unmistakable styling, Porsche-standard performance and luxury, seating for four in well-appointed interior and hybrid powertrain available No Credit / Bad Credit / No Paystubs, No problem !! ! All Approved ! Everyone drives ! CLEAN, GORGEOUS, LOW MILES, SHOWROOM CONDITION. CALL NOW QUALITY CERTIFIED up to 10 YEARS 100,000 MILE WARRANTY , To Certify a vehicle, there will be an additional cost for Certification. CALL NOW For details. STUNNING AGGRESSIVE LOOK ON THIS BEAUTIFUL--Call today to schedule a test drive... Good Credit/Bad Credit/No problem!!!! Get paid cash? No problem!! 100% Credit Approval with interest rates starting at 2.49% for qualified customers, our rates will not be beaten. We price our cars at wholesale price to guarantee the best deals for our customers. Our inventory moves quick, please call to confirm the availability of the vehicle of your interest Springfield location 973-564-0112. This vehicle is located at our SPRINGFIELD location. Come visit our new showroom in Springfield NJ.